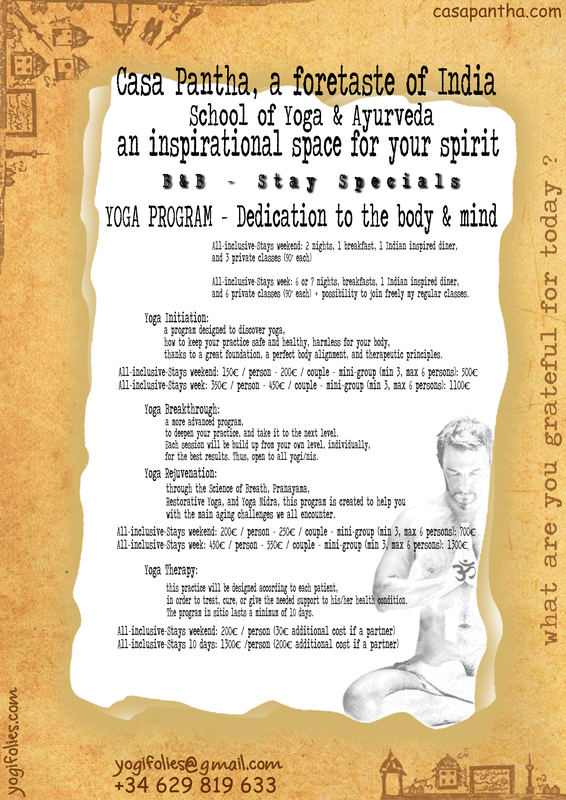 Yoga Initiation: a program designed to discover yoga, how to keep your practice safe and healthy, harmless for your body, thanks to a great foundation, a perfect body alignment, and therapeutic principles. Yoga Breakthrough: a more advanced program, to deepen your practice, and take it to the next level. Each session will be build up from your own level, individually, for the best results. Thus, open to all yogi/nis. Yoga Rejuvenation: through the Science of Breath, Pranayama, Restorative Yoga, and Yoga Nidra, this program is created to help you with the main aging challenges we all encounter. Yoga Therapy: this practice will be designed according to each patient, in order to treat, cure, or give the needed support to his/her health condition. Click here to go to the page & see all informations. All-inclusive-Stays weekend: 150€ / person – 200€ / couple – mini-group (min 3, max 6 persons): 85€/pers. All-inclusive-Stays week: 350€ / person – 450€ / couple – mini-group (min 3, max 6 persons): 180€/pers. All-inclusive-Stays weekend: 200€ / person – 250€ / couple – mini-group (min 3, max 6 persons): 115€/pers. All-inclusive-Stays week: 450€ / person – 550€ / couple – mini-group (min 3, max 6 persons): 215€/pers.